The company itself was very easy to deal with and had a quick response time to my questions/concerns. The product itself it a great idea. Trust me, trying to find all the colored candles on your own is time consuming and would cost a fortune. This product is a time saver and budget friendly. Comes nicely packaged. Advantages: Nicely packaged, great gift idea. Such a unique gift that is beautifully boxed with the poem. Always so well received by brides-to-be. 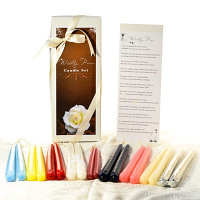 Advantages: All the candles are supplied and beautifully boxed. Poem is nicely printed. Disadvantages: If recipient can't have children, the "baby" part of the poem hurts. I added "kitty" after baby. I am sure someone could add "puppy" too. Very nice item. I moved the candle poem to the outside of the box. Everything looks fine, good packaging to keep the candles safe. I love this candle poem set. This is my "go to" for all bridal showers. This is the fourth set I have given and it's a hit everytime! beautiful idea for a bridal shower. Amazing gift for shower and bachelorette!!! And even an addition to a wedding gift. Read it to the recipients and they loved it!! Got many inquiries and sent referrals your way! Great price loved that the white was wrapped with lace already! I plan on displaying them in a basket and give them to my daughter @ her Bridal Shower. I know she will love it and be thrilled to use each set on those special times! Very nice set of candles. The bride-to-be loved them! Thank you for a good first-time shopping experience! Advantages: No shopping for different candles, reasonably priced, beautiful sentiment. I am very pleased with the wedding poem candle gift. The candles are good quality and the poem is on a sturdy piece of paper. In addition everything is in a gift box tied with a bow! The price was reasonable and delivery was prompt. Advantages: The gift is all put together for me, no need to buy candles individually, print poem and box. Liked that everything came together. Advantages: No shopping to find each individual color candle. Can't always find the right colors. Disadvantages: Wished you would of offered the candlestick holders for the two different sizes of candles. Needed to have a question that said would you like to purchase the candleholders that go with the candles in the set? I would of purchased them just to save time. I did not want to have to figure out what size I needed. Also wished the candles would of been cut apart and that they would of come packaged differently. The navy candles have left navy wax on the dividing paper and the silver candles look like you purchased those from a store. I know it will be 25 years before they are used and they should be wrapped but they look a little tacky. What a perfect gift. It brought tears to everyone's eyes at a bridal shower. Thanks. I ordered this product and received it two days later! Your service is amazing and the candles arrived in perfect condition, nicely packaged. This was a gift for my daughter's bridal shower. A quality product. My shipment was incomplete but Keystone was very responsive to my email and corrected the order immediately. The candles were given at a Bridal Shower and were a hit. The bride-to-be read the poem and everyone applauded. Thank you for a superior product. My husband just loves this smell, reminds him of spring. Awesome smell! I haven't had a candle from you yet, that I didn't love the smell. Thanks.